Isis is not the only Goddess Who is called Great of Magic. Many of the Great Goddesses bear that epithet, too: Hathor, Sakhmet, Mut, Wadjet, among others. Gods are also Great of Magic, notably Set in the Pyramid Texts. There is also an independent Goddess named Werethekau. As so many Deities were, She was associated with the king, and especially during his coronation. 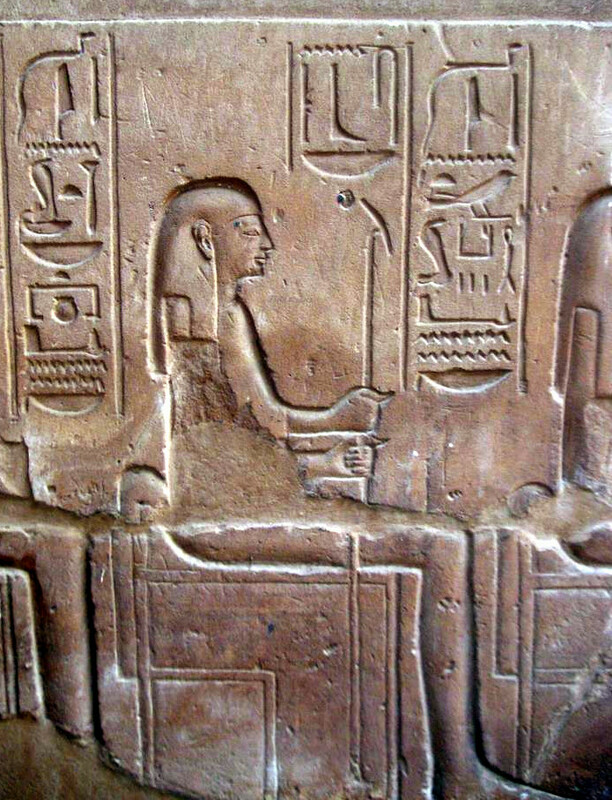 There had been some doubt among Egyptologists about whether Werethekau was indeed a separate Goddess. But recently, Ahmed Mekawy Ouda of Cairo University has been doing a lot of work tracking Her down. (She was also the topic of his thesis, which I hope to get a copy of someday soon.) He’s gathered references to a priesthood and temples for Her that seem quite clear. More on all that in a moment. Some amulets, including a vulture amulet, a cobra amulet, and, as in the example above, the Eye of Horus amulet are also called Great of Magic. So is the adze used in the Opening of the Mouth ceremony. With all this great magic going for him or her, the king or queen becomes Great of Magic, too. King Pepi Neferkare is told, “Horus has made your magic great in your identity of Great of Magic” (Pyramid Texts of Pepi, 315). Queen Neith is told, “Horus has made your magic great in your identity of Great of Magic. You are the Great God” (Pyramid Texts of Neith, 225). I wonder whether there might be some primordial connection between the Great of Magic royal crowns and the Great of Magic royal throne—Who is Iset, the Goddess Throne. Perhaps we can understand the accouterments of kingship as personified extensions of the Power, Divinity, and Magic of the Living Great Goddesses, which were empowered by Them in order to bestow upon the king his own power, divinity, and magic. 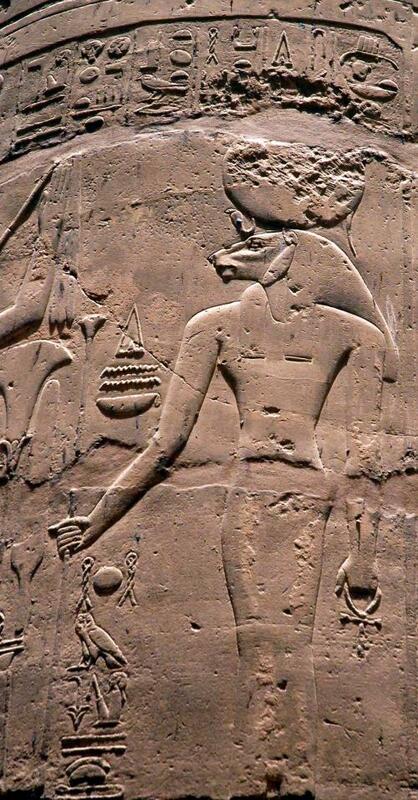 A cobra-headed Werethekau…also from Karnak. Lots of Great of Magics at Karnak, eh? Or should that be Greats of Magic? The Uraeus Goddesses or Eyes are powerful, holy cobras Who emit Light and spit Fire against the enemies of the king and the Deities. 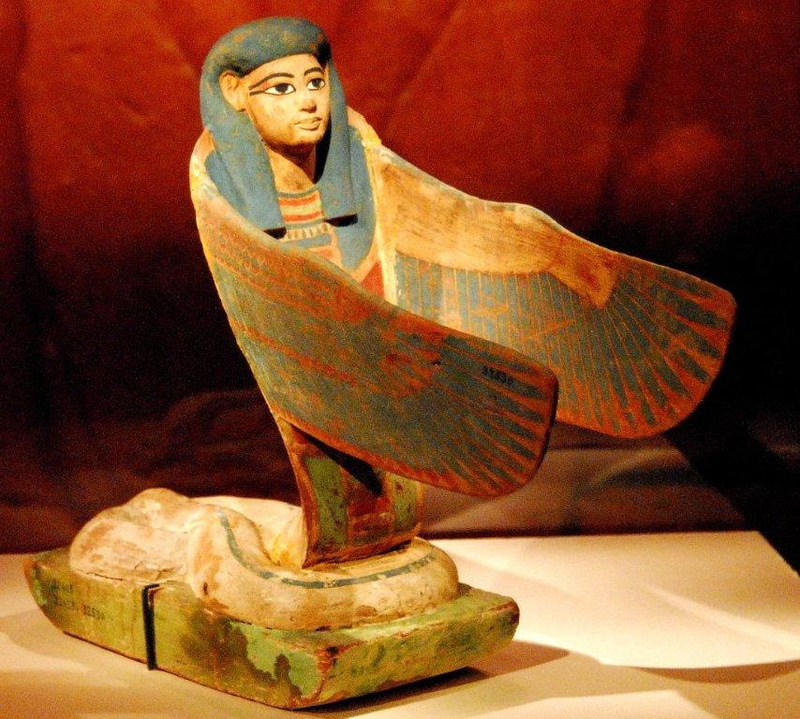 Learn more about Isis as Uraeus Goddess here. When Werethekau is an independent Goddess, She may have the body of a woman and head of a cobra, be in full cobra form, and we even have a few instances of the Goddess in full human form. 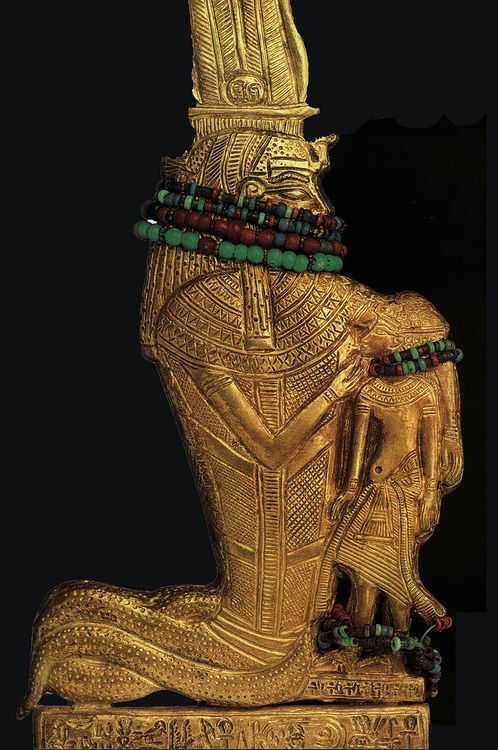 Among Tutankhamun’s grave goods is a figure of Werethekau with a human head and cobra body nursing a child Tut. She also has a lioness form. 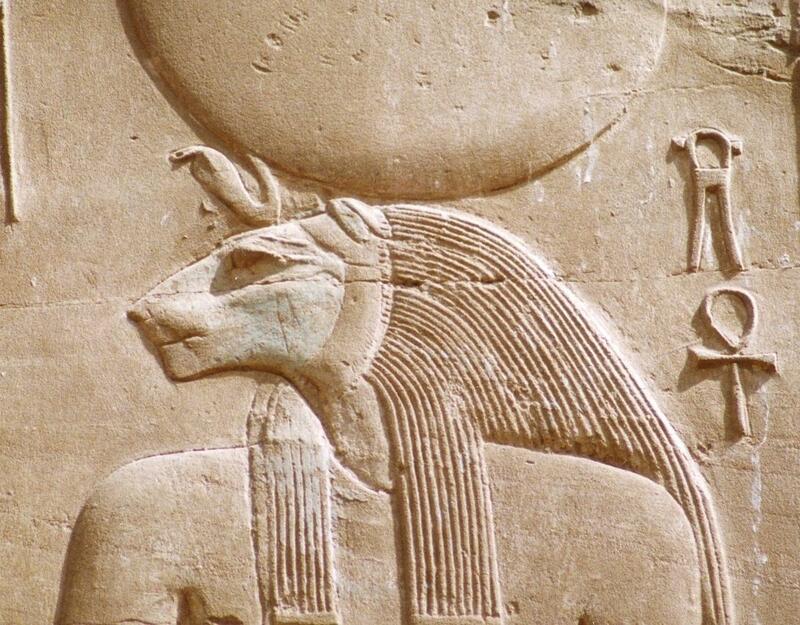 We know of a lionine Isis-Werethekau from the hypostyle hall at Karnak. A number of the Goddesses with a feline form—Sakhmet, Mut, Pakhet—were also known as Great of Magic, so we can understand that powerful magic has not only a protective and nurturing side, but also a fierce and raging one. Which seems about right if you ask me; magic can be very positive and healing or, if used unwisely, a real mess. Isis-Werethekau from the Great Hypostyle Hall at Karnak. You can read Her name in the hieroglyphs above Her. Click to enlarge. So far, I haven’t tracked down the oldest reference to Isis as Great of Magic. Since She has always been a Goddess of great magical power, the association is ancient. Perhaps it has always been. Perhaps there’s something to my guess about The Great-of-Magic Throne. Or perhaps Professor Ouda will come to my rescue when I finally get a copy of his thesis. In Ouda’s article outlining some of the references to Werethekau’s priesthood and temples, several of the extant references to Werethekau also tie-in Isis and Her Divine family. 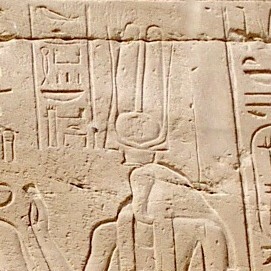 Ta-mut-neferet holds the hand of a man identified as “the servant of Osiris.” Another stele calls Werethekau “Lady of the Palace” and is dedicated by a chantress of Osiris, Horus, and Isis. A man who was Second God’s Servant of Osiris, God’s Servant of Horus, and God’s Servant of Isis was also God’s Servant of Werethekau, Lady of the Palace. Ouda also notes that Lady of the Palace may be Werethekau’s most common epithet. That is quite interesting in light of the fact that Lady of the Palace (or House or Temple) is the very meaning of Nephthys’ name. (Learn more about that here.) And of course, She, too, is called Great of Magic. Together, Isis and Nephthys are the Two Uraeus Goddesses and the Two Great of Magics. So if the question is, “is Werethekau an independent Goddess, a personified object, or an epithet of other Deities?”, the answer is, “yes”. With the beautiful and, to my mind, admirable fluidity of the Egyptian Divine, She is all these things…and most especially, a powerful aspect of Isis, the Great Enchantress.